The 907 consists of two logic gates, each composed of four transistors and an equal number of resistors. The transistors are the small green boxlike features with the overlapping beige bars (within the two inner boxes encircled by the dark red lines); the resistors are the perpendicular green bars. A large fifth resistor lies at the bottom. 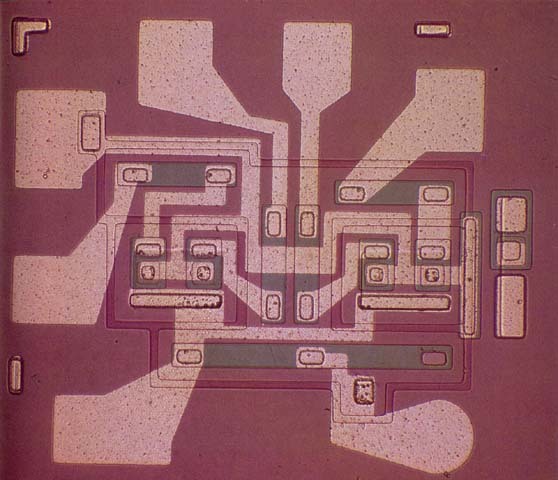 The dark red lines are the visible edges of isolation channels, while the beige features are aluminum conductors. Actual size: 0.038 x 0.048 inches.